In Sulawesi, a remote part of Indonesia, the departed remain part of the family’s daily life long after they have left the mortal world. The people from this remote parts are known as Torajans. 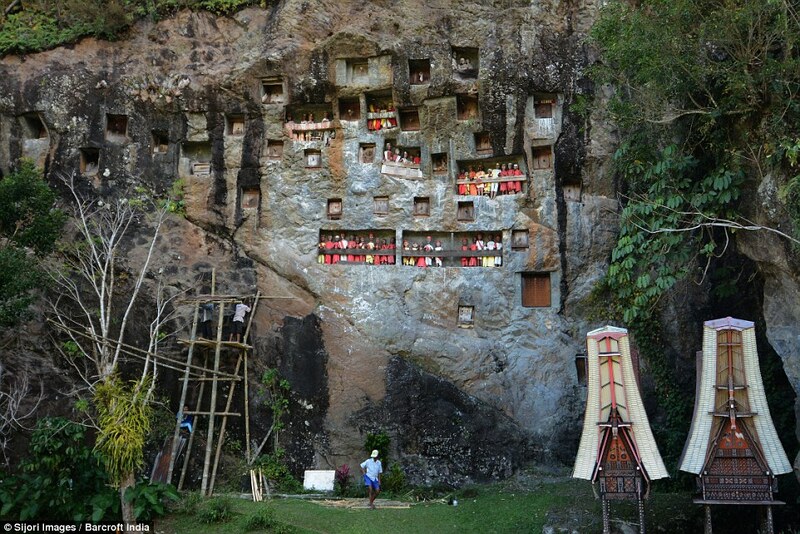 The bizarre funeral ritual of Toraja has evoked shock, amazement and empathy among the tourists who flock to witness the Ma’Nene. The Torajans do not consider death as the ultimate event, as a final severing of ties. Rather, it is a gradual process towards Puya or the afterlife. During the waiting period, the late loved one’s are tended with care and affection. The body is dressed in good clothes. They are offered breakfast, lunch, dinner and refreshments. The family members speak to them as if they are still alive. Visitors come to pay their respect. The waiting period can extend days, weeks or even up to years. So, the body is treated with formalin solution to prevent putrefaction. The formalin treatment immediately after death means the body will start mummifying thus preventing decomposition. The body is draped in several layers of cloth and is kept in a tong Konan (the ancestral house of theTorajans). The soul is said to linger around the village until after the funeral ceremony, after that the soul begins its journey to puya. A funeral ceremony is an expensive event that lasts for days. A large site is cleared to accommodate the upcoming death feast. This ceremonial site is called rante and is specially made by the mourning family. The rante is a grassy field where temporary shelters for accommodating the audience, rice barns, and other ceremonial necessities are erected. Flute music, funeral chants, songs, poems, crying and wailing are the traditional expressions of grief. The slaughtering of water buffalo is an important part of the Torajan death ceremony. Grander the funeral ceremony, greater the quantity and quality of buffalo. Buffalo carcasses, including their head are lined up in the field waiting for their owner (the departed soul), who is in the “sleeping stage”. The Torajans believe that riding on a buffalo will get the ‘souls’ faster to puya, hence, tens of buffaloes are slaughtered during the funeral ceremony (of course, this is dependent on the status and financial position of the family). At the end of the prolonged funeral ceremony, the body is taken for burial in a wooden Duba Duba (a funeral bier that resembles the tongkonan). There are three methods of burial. The coffin may be laid to rest in a grave or a carved stone grave or even hung on a cliff. The stone grave is usually expensive and is used by notables or wealthy. A wood-carved effigy (tau tau) resembling the dead person is normally placed on the stone cave (grave) overlooking the land. The coffin of a baby or a child is hung from a tree or cliff. The coffins are left to hang’s until the rotting rope cause it to fall to the ground. Ma’Nene or ‘second funeral’ takes place in august where the bodies of the deceased or exhumed, cleaned, combed and dressed in new clothes. The bodies are dug up by the family. The corpses are cleaned and are taken to the place they died. They are then taken through the village following a straight path. Damaged coffins are repaired or replaced and the exhumed bodies return to rest in this coffin until next august. Next article 15 Eye-opening Researches and Facts about Depression That Everyone Must Know!